For the record, my grandmother caught me reading the Jackie Collins book…so she had words with my mother about my reading habits. Mum caught me reading ‘Salem’s Lot, which caused her to have words with my grandfather about the books he was sneaking me. If nothing else, it made for interesting holidays. To this day, I often feel the need to “sneak off” to read a book. Weird. 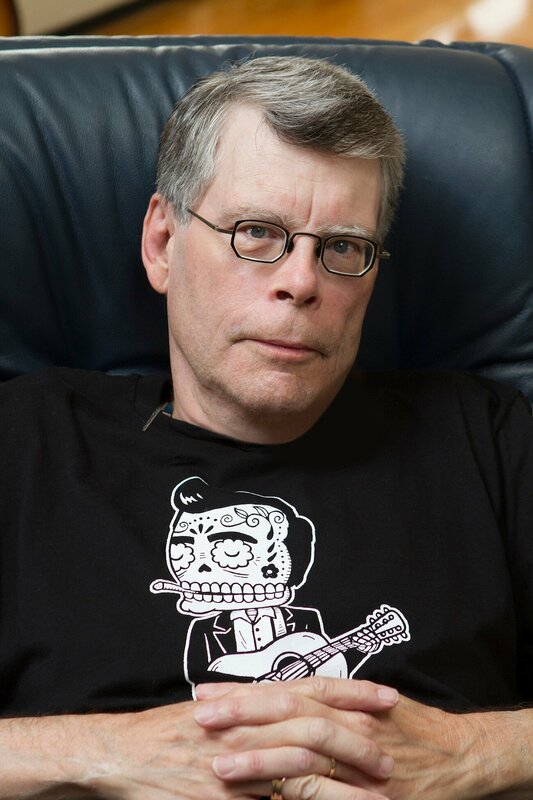 If there has been one author whose work has constantly been in my home, it has to be Stephen King. After ‘Salem’s Lot, I found my Mum’s copies of Cujo, Carrie, The Dead Zone, and Firestarter — cleverly hidden in a bookshelf beside a book about the restoration of Michelangelo’s Sistine Chapel paintings. My parents actually bought The Eyes of the Dragon for me for either my birthday or Christmas. I remember being impressed because it was the first King novel that they bought specifically for me (it was fantasy, “not horror”). I read The Talisman in French because it was available in our high school library for those of us who were working on becoming bilingual. The Shining and IT scared the bejeebers out of me, and my Mum and I compared notes regarding book vs. mini-series when it came to The Stand. There are, of course, so many others. I never cared for Misery, and never read Gerald’s Game, but I enjoyed The Green Mile, so I guess that makes up for that. When the Husbeast and I moved in together, we found that there were a lot of duplicates — mostly Stephen King books (a few Anne Rice books, but mostly King). This is not a bad thing, as both sets of books are in varying states of distress (my copy of The Stand is so battered that the cover is threatening to secede from the greater portion of the book). He was wild for the then-unfinished Dark Tower series; I was a plain old paranormal adventure kind of girl. Between paperbacks and hardcovers, there are easily two full shelves of King’s books in our house. Usually two books deep, by the way. Oh, every so often either of us would come home with a John Saul or Dean Koontz book…but we always return to King. We were concerned when we heard about his accident. The Husbeast was extra-concerned because there was that slim chance that the Dark Tower series would go unfinished. He needn’t have worried — Mr. King never lets us down. As a funny ending to this small tribute, the parents who caught flak for letting me read horror books as a child have become my enablers. The past two Christmases have netted Doctor Sleep and Revival — both in hardcover. I guess that some tastes just never change or go out of style! I read my first Stephen King book 2 years ago with 11/22/63. I liked it but Doctor Sleep was a bit better. Then I did a read-a-long for Salem’s Lot because I like vampires. There is something about his style of writing that grates my nerves. I know it’s terrible of me to say that . Maybe I should’ve started reading him sooner. My boyfriend is a big fan of his. One of the things I’ve always admired about King is that he took Horror away from being a Gothic genre that happens to rich people in mouldering castles & brought it to the everyday suburbs. His characters talk like real people – they use colloquialisms and don’t always behave. He also stretches the genre out beyond vampire tales or ghost stories – his work encompasses a very broad spectrum. That said, it’s doesn’t mean that everyone is going to like it.